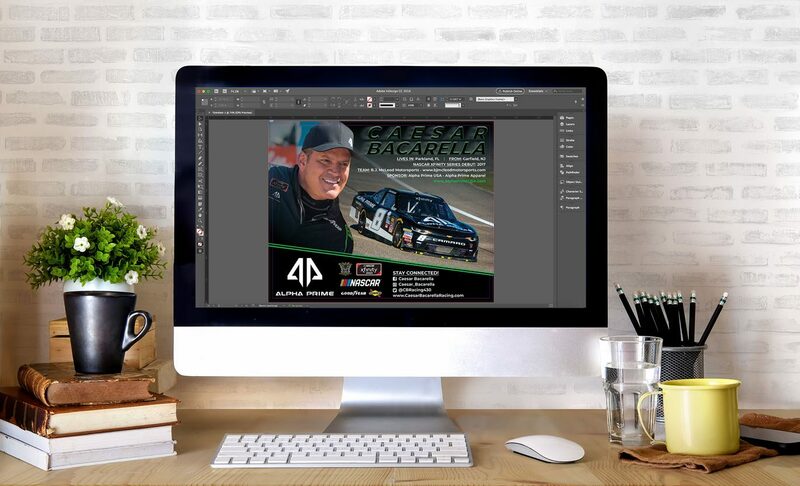 Are you looking to grow your fan base, showcase your sponsors, and highlight your racing stats? You’ve come to the right place. At Primoprint you’ll work directly with our in-house U.S. based design team to create professional, custom hero cards. When you order hero cards, you can opt to add design services to your order. After you’ve completed the checkout process, our design team will contact you via email to get started. They’ll ask you to provide a summary of what you are looking for design wise, any assets you would like to have included in the design, and then they’ll get to work. When the design is complete, you’ll receive your first proof to review. You can suggest modifications that you would like to have made at this time. Your design fee includes up to three rounds of revisions to help ensure you are satisfied with the final result. We ask that you provide all images, content, and logos that you would like to have printed on your hero cards, along with a brief description of the design style you are looking for (feel free to provide an example of a card design you like). All images are required to be high-resolution, print quality images. These should be 300 DPI and not pulled from the internet or social platforms. If you work with a photographer on your car and portrait images, be sure to ask them to supply you with high-res images. Pro Tip: Ask your photographer to provide you with a few photos with transparent backgrounds. That way your car and portrait can be combined to create a more complex and modern design. Please provide all logos in vector format (file ending will be .ai, .eps, or .pdf) to ensure they will be scalable, legible, and not pixelated. If you do not have a vector copy, reach out to your sponsor, and they will be able to provide you with one. Provide all content for your bio, stats, social profiles, and contact information that you would like to have included on the hero cards as well. Content will need to be provided in a text document so it can be copied and pasted into your design. Doing so will help ensure the accuracy of the text on your hero cards. Tommy Good recently moved up to racing Legends cars, and he needed a new design for the upcoming season. Our design team had the pleasure of working with him on the redesign of his hero cards. Tommy’s dad was able to supply all of the necessary photos, logos, and content, and our designers exceeded their expectations. Take a look at the before (left) and after (right). We could not be happier with Tommy’s hero cards. They are great. Thank you for all the work you did for these! If you’re interested in following Tommy’s journey as a driver check out his facebook page. The general turnaround time for your first of hero card design proof is 2-3 business days. Depending on the number of revisions you can expect to have your final approved design within 3-4 business days. With nine printing facilities across the United States, we can print and ship your hero cards typically between 1-2 business days. We recommend ordering your hero cards and design services at least two weeks in advance from the time you need them. Placing your order ahead of time will give our team ample time to provide you with high-quality artwork and our production facility enough time to get your cards to you. Our professional hero card design services are $150. This price includes your design and up to three rounds of revisions. 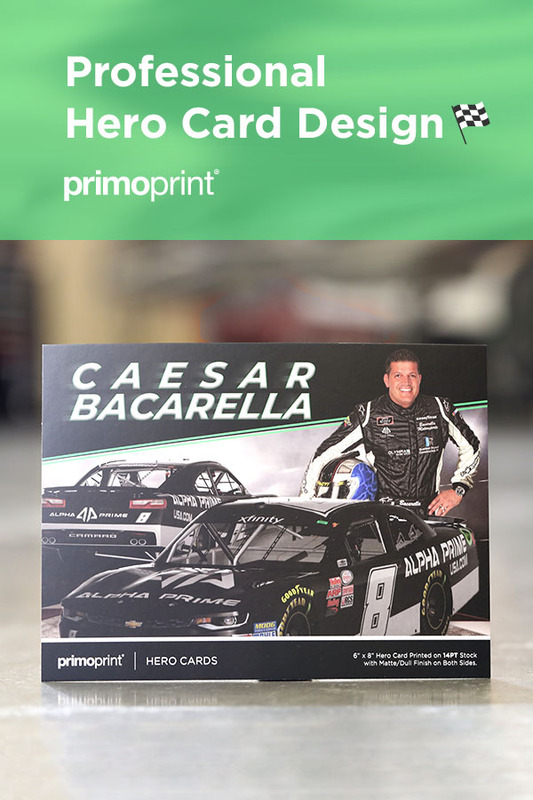 Printing your hero cards with Primoprint gives you the peace of mind that you are getting the quality you’re looking for at an affordable price. The below chart shows our pricing for 16PT Matte or Glossy UV hero cards. Want to check out the quality of our products before purchasing? Request a free hero card sample pack. Have any questions about our hero card design services? Post them below, and we’ll be happy to provide you with further information.